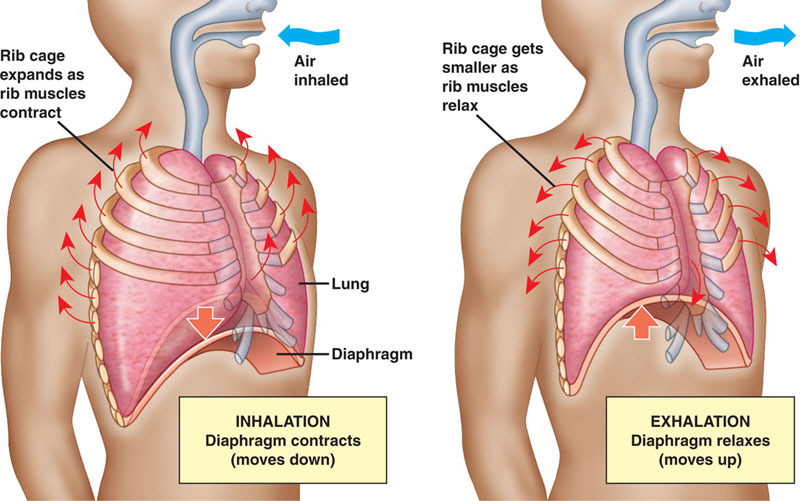 Breathing is the process that moves air in and out of the lungs. Aerobicorganisms require oxygen to release energy via respiration, in the form of the metabolism of energy-rich molecules such as glucose. Breathing is only one process that delivers oxygen to where it is needed in the body and removes carbon dioxide. Another important process involves the movement of blood by the circulatory system. Gas exchange occurs in the pulmonary alveoli by passive diffusion of gases between the alveolar gas and the blood in lungcapillaries. Once these dissolved gases are in the blood, the heart powers their flow around the body (via the circulatory system). The medical term for normal relaxed breathing is eupnea. Anxiety, Fear and Breathing It is one thing to be alerted to a threat but altogether another to over react with a tendency towards fear, to fight, to flee, to feint, freeze, fake it, fumble, mumble or stumble. There are many causes of anxiety. Food additives, sugar, adrenal dysfunction and other internally consumed substances. Situations in life that are threatening or seem so will cause anxiety. The idea you do not have enough time is a huge cause of anxiety. Taking on too many projects or responsibilities invites anxiety and we too often forget we chose and often can un-choose. Spending too much money, getting into debt and worrying about that will cause anxiety. Eventually a certain level anxiety becomes an every day occurrence that we sort of get used to. The breathing pattern sets in and never leaves. In other words bad breathing from excessive stress or anxiety or trauma invites more bad breathing and/or anxiety/nervousness which causes worse breathing which causes more nervousness. It feeds itself and often changes to panic.